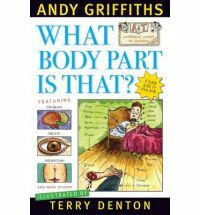 A very educational book, no make that totally uneducational book about body parts. It contains everything you never needed to know about your body. There is no story or plot and it is the second of the Wonderful World of Stupidity Books (What Bumosaur Is That? was the first). The quote on the front cover perhaps says it best, ‘A stupid guide to your body’. However it must be said that it is a very comprehensive stupid guide. They cover it all; from the hair on your head to the toes on your feet and everything in between, including a debatable section on farts. This is a very funny book, full of silly even ridiculous humour and some stuff that is just plain funny. If you love the Andy Griffiths books and the wonderfully cartoonesque illustrations of Terry Denton then you will love this.